For farm owners or managers looking to minimise the running costs and increase the efficiency of their business, renewable heating solutions such as air source or ground source heat pumps offer many advantages. The farming industry has unique heating and cooling requirements. For instance, a typical farm is reliant on high temperatures for cleaning and sanitising equipment, and low temperatures for keeping produce fresh. Each farm comes with its own unique demands for heating and cooling dependent on the processes carried out on that farm. A heat pump is well suited to farms because of the versatility they offer as a means of both heating and cooling. Heat pumps can store the excess thermal energy produced from one process – cooling fresh milk in a milking parlour, for example – and transfer that energy as usable heat elsewhere on the farm – farmhouse, animal welfare, etc. Heat pumps can be tailored to meet the exact heating and cooling needs of any agricultural setup. A thoughtfully designed farming heat pump system can yield incredible results in terms of lower running costs, reduced CO2 output and greater overall efficiency. Typically, farms are reliant on burning fuel (usually oil) for heating or electricity for cooling on their property. Farms that generate a lot of heat are spending sums of money on fuel every year and the cost of fuel can often fluctuate, adding an unwelcomed uncertainty for business owners. A heat pump absorbs naturally produced thermal energy stored in the air, ground, liquid or waste of the farm, compresses it to raise its temperature, and deploys it as heating or hot water in any building on the farm. A farm’s heat pump can produce the temperatures needed for any application: from sanitising equipment to heating a barn or farmhouse. The versatility of a heat pump as a source of both heating and cooling means businesses can move away from the multiple systems currently used to one highly efficient, cost-effective solution. As well as the cost savings that are to be realised from installing a heat pump on a farm, there are also incentives offered by the government to entice farm owners to switch to renewable forms of energy. 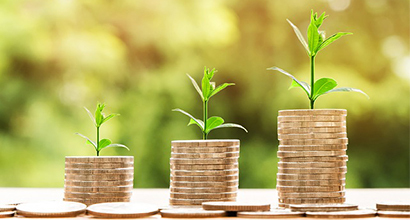 The commercial or non-domestic Renewable Heat Incentive (RHI) provides quarterly payments over 20 years based upon how much heat the property generates. Farm owners in particular stand to benefit massively as many agricultural applications require a lot of thermal energy to be generated. Heat pumps are well suited to agricultural businesses because of the ample land that’s available to farm owners to install a heat pump system with minimal disturbance to that land. Generally, farm owners or managers opt to install a ground source heat pump as they yield the greater results in terms of efficiency and cost savings. 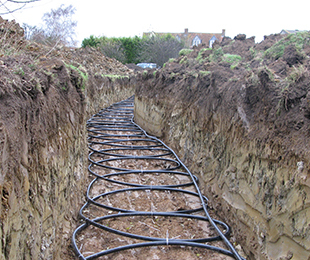 A major upside to installing a ground source heat pump on a farm is that systems installed in a horizontal trench are typically buried at 1.2M – 1.5M below ground. At this depth, it is safe to continue using the land for crop growth or grazing. Once installed, heat pumps are very low maintenance. It is recommended that a heat pump gets an annual service to ensure it is running at optimal efficiency, and in doing so a typical heat pump system has a lifespan of over 20 years. 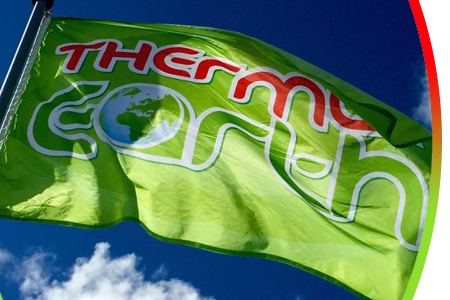 At Thermal Earth, we are the UK exclusive distributor of MasterTherm heat pumps. As well as sophisticated, market-leading technology that allows for remote online maintenance, MasterTherm heat pumps come with a 7-year warranty to provide you with peace of mind. As well as being a cheaper alternative to traditional heating methods, heat pumps aren’t reliant on burning fossil fuels and are therefore a much cleaner, environmentally friendly alternative. Not only do you stand to reduce your annual spend with a heat pump, you’ll also dramatically reduce your carbon footprint.